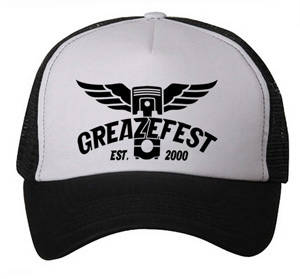 Thank you for dropping by the GreazeFest Merch Shop. 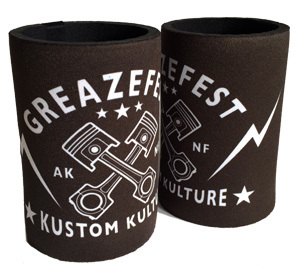 Here you can select a neat range of kool gear at any time of the year. Your shop orders are processed via Paypal, and posted direct to you within 7 days of ordering. To order any item, click the Add to Cart button, then just follow the prompts. 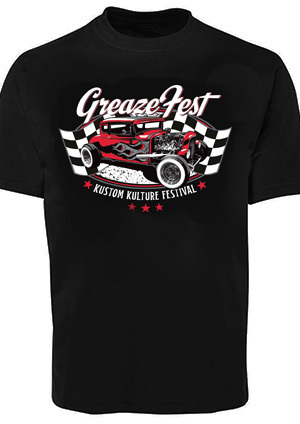 Kool hot rod with crossed flags for GreazeFest 2018, designed by Lori Lee, print on shirt front, 2018 bands on the back. 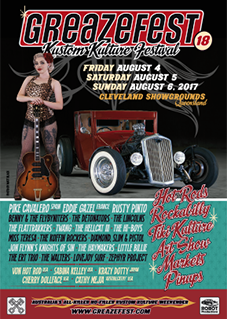 Kustom kulture pickup truck design on white shirt, print on shirt front with 2017 bands on the back. 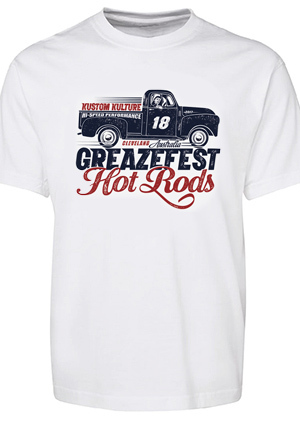 Traditional hot rod black and white shirt for 2017, hot rod print on front with 2017 bands on the back. 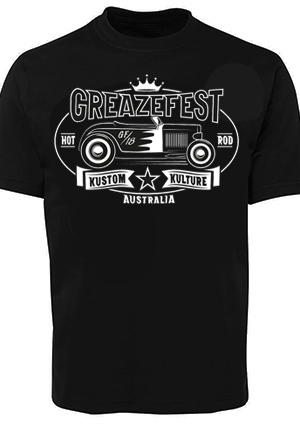 GreazeFest crossed pistons in grey, on black shirt front, with 2017 bands on the back. 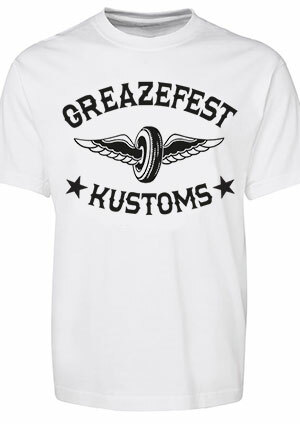 Classic GreazeFest Kustoms winged wheel logo on white shirt. Front print only. 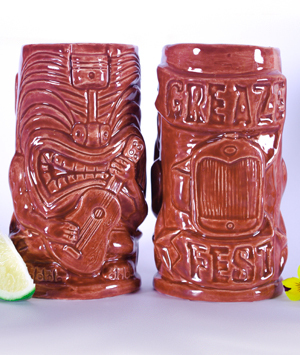 Our piston head tiki man for 2018 playing a ukulele. 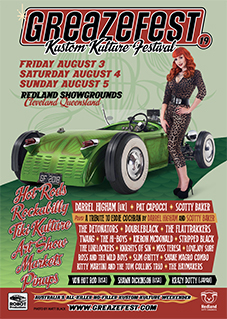 Designed by Lori Lee and Danielle Mann. 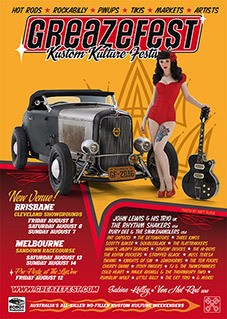 Hand made in Australia by Black Lagoon Designs. Click 'Add to Cart' to order. 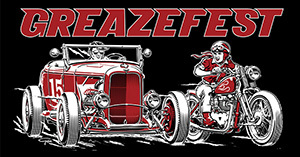 Cool crossed pistons and lightning bolt design. Cool flying piston design, adjustable size. 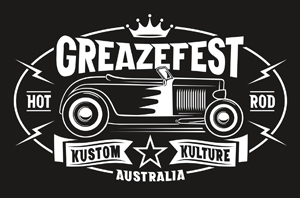 Get a whole bunch of cool GreazeFest stickers in one go! 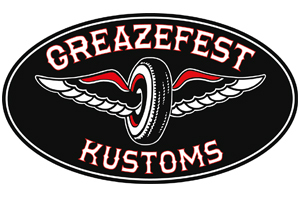 GreazeFest flamed sled racing flags design. 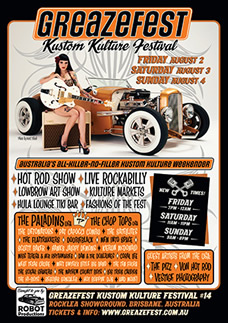 Quality outdoor vinyl bumper sticker, made to last. 16cm x 7.5cm. 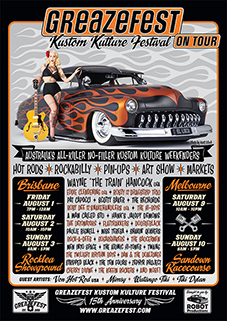 Sensational new sticker featuring Ger Peter's artwork with hot rod and motorbike racing. Quality outdoor vinyl bumper sticker, made to last. 16cm x 8cm. 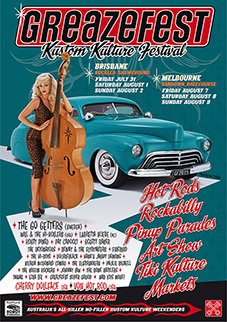 Posters are all size A2 (594mm x 420mm),sent in protective mailing tube. 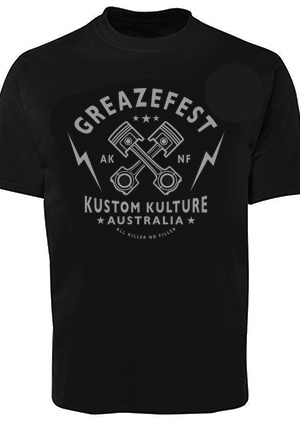 Price: $3 each, plus $12 postage within Australia.